Artisans during Skill Development Training working on new designs. Six different kinds of stitches were enhanced in the Skill Development Training. The designer from Indus Valley School of Arts and Architecture (IVS) delivering the training session at Kando Mehgwar village. Artisans of Talomalo village practicing tracing on fabric at the vocational center. New stitches and designs were introduced to the rural artisans of Umerkot. Artisan practicing her writing skills during the Adult Literacy Training. 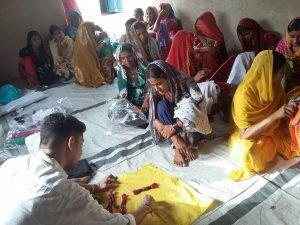 Community world Service Asia’s livelihoods and women empowerment project, supported by YCARE and UKAID, in Umerkot district has initiated its third year this April. The activities under the project aim to empower local women with a sustainable increase in their household income through enhancing their handicrafts skills and connecting them with markets, among the many other components of the project. This year, three hundred new artisans have been selected from nine new villages in Union Council Karroo Syed and Sabo this year. A six months training was designed in two phases, each of three months, on Skill enhancement and Product Development with the expertise of designers from Indus Valley School of Arts and Architecture (IVS) Karachi. The designer identified six main stitches for skill development, namely Kacho, Pako, Muko, Chain, Kharak and Hurmuch. 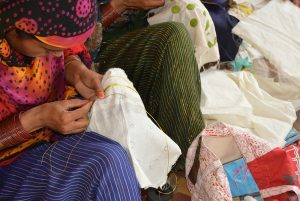 During the first three months of the training, stitching and embroidery skills of local artisans’ part of the Women Enterprise Groups (WEGs), were enhanced. The skill building mainly focused on building upon the traditional skills that these women already had but in more accordance to latest fashion trends and market demand, which were lacking in their previous home-made products. These skill enhancement classes were organized by Community liaison officers (CLOs) and mentored by Enterprise Development Officers (EDOs) of Community World Service Asia. In addition, artisans were also taught the value addition of using the right color combinations, designing and cuts and quality control- all aspects which are pivotal to the urban buyers. For budgeting, pricing and dealing with customers, the artisans were given a three months training on adult Literacy courses which enabled them to read, write and compute during their business dealings. 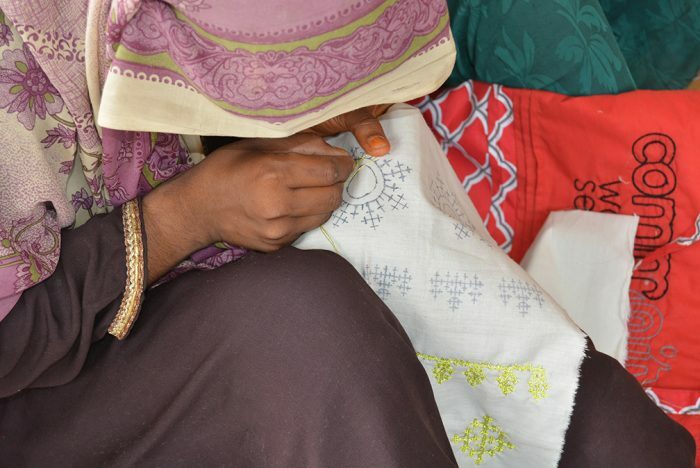 The determined women from Umerkot are currently practicing their newly acquired skills by working on test products using modern designs and fashionable color schemes. This will particularly allow artisans to improve their quality of work and design which will increase the value and exclusivity of their handmade products. Women Enterprise Group is group formed of rural artisans, producing hand-made products, in the vocational centers established in various villages of Umerkot.